Last weekend Flat /Not Flat, the show I curated at Artspace New Haven, opened. I have images and my statement for the show below. At the bottom I have included some additional thoughts on the show that didn’t make it into the statement. It was my pleasure to work with the staff at Artspace and these 4 artists. Enjoy. 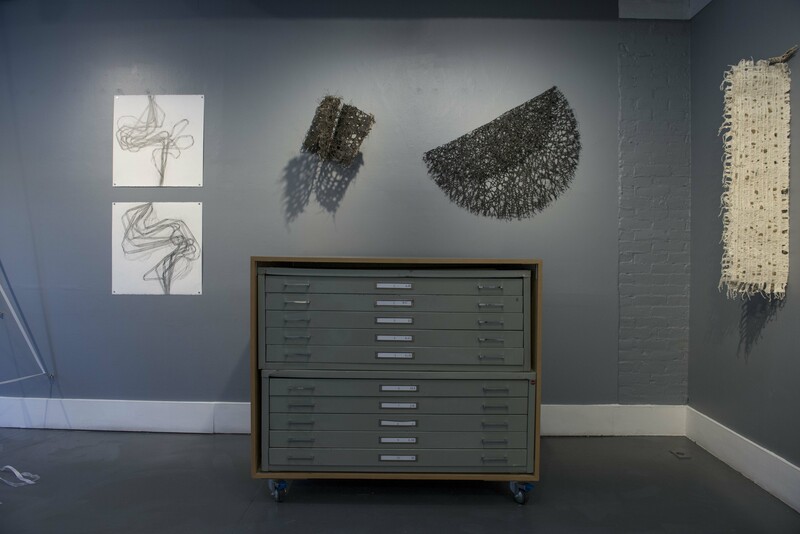 The goal of Flat /Not Flat is to present a larger context for the work of four artists engaged in Artspace’s Flatfile program. These four artists, Jennifer Davies, Karen Dow, Alisa Dworsky and Martha Lewis all create vibrant multi-dimensional works that exist beyond the flat plane. They will present this work along side their flat file entries. The “Not Flat” portion of their exhibition will reflect each artist’s process and body of work. Jennifer Davies produces handmade paper constructions that push the boundaries of flatness. Her work often exists as both paper and sculpture. The process of dipping string into paper pulp creates complex netted forms that recall nests, webs, hives and highly intricate natural phenomena. The fibers that cling to the string would become flat if treated in the traditional papermaking method, but Davies’ process coaxes them into new forms. These are presented both flat and as a sculptural work. Jutting away from the wall, Sussurro, a bisected piece of netted string becomes a honeycomb full of small, unreachable places. Night Lap, an all black net folds in on itself to create an eclipsed moon, slowly collapsing. Karen Dow makes flat works on paper and canvas, but in the construction of her monoprints she employes cut paper forms. These monoprints exhibit both the effect of and presence of collage in the printmaking medium. Dow takes inked and cut paper to print unique images, building and reforming its structure. Some are then built upon with gouache and some with collage of the print materials as well. The whole work becomes a marriage of the materials which created it and the architecture within. In Dow’s prints, it is often form that informs structure and color that informs space. Alisa Dworsky builds large scale installation works with rope, ribbon and fabric. Her works on paper portray these materials in a state between sculpture and flatness. For Flat / Not Flat, Dworsky has constructed a site specific piece employing an open weaving technique, anchored and then balanced by counterweights. Dworsky’s form will take up a full corner of the room, but in essence the material, ribbon, is flat. It is the artist’s treatment of the space and material that lend it weight and volume. The diagonal weave becomes a drawn line in space. Dworsky’s drawings, graphite rubbings of ribbon, are full of differentiated light and depth. They directly relate to sculptural material but also exhibit its flatness. Martha Lewis creates works on paper that are often folded, crumpled or bisected into a larger dimensional form. She combines schematic drawings and non-scientific systems to create unreal spaces. This merger is a hybridized vision that has been shared by artists and technological innovators throughout the ages. Lewis presents a folded map that combines these elements and does so in a three dimensional form. The map and the drawing fold in on itself. A tesselated drawing and a crumpled paper form become objects that exist in different states while possessing the same properties. Their similarities are greater than their differences. The complexity of the crumpled form and the represented isometric forms of the drawing expand on real and imagined space. Together, these artists explore their materials to produce works with and on paper that alter the viewers notions of flatness. Working on Flat/ Not Flat was a reminder of how rewarding it is to get to work with artists and impact one another’s lives. Each had their own way of approaching this small group show, but the nice thing was that there was no ego. Everyone gave their time and energy. I am grateful for the assistance and trust of Helen Kauder, Martha Lewis, Katie, Michael, Patrick and Sasha at Artspace. All of these artists allowed me into their studios and into their process. Jennifer Davies is a rebel. She makes sculpture and works made of paper that look all their own. There are artists whose work you can relate it to (Louise Bourgeois, Lydia Bengalis, Sheila Hicks), but the texture and feeling of these pieces are unique. Davies manipulates paper pulp to create paper objects that exist as sculpture. The reason I use the term “work of paper” is because they defy the usual terminology for paper. Her status as a rebel is clear to me, as her joyful disregard of the rules of papermaking serves her well. I find myself thinking time and again about the small spaces in her works. The caverns and gaps in these spaces should fill with sap, then eventually amber, and become part of how the world is made. Karen Dow makes paintings and prints out of blocks of color. She was building a body of monoprints when we first met and frankly, I was smitten with them. They embodied so much of what I love about abstraction and played with Albers colors eschewing his hard edge. Conversations led to thoughtful collaboration and though her work is the “flattest” in the group, they contain great depth. Showing the cut paper that make up, and are occasionally collaged into the monoprints was Karen’s idea. As an educator she wanted people to see some of how these images were made. The cut paper on the table makes me feel at home with all of the prints, as though I get to see the sheet music and hear the opera together. Alisa Dworsky built something quite remarkable with Drawn Out. It conforms to the space without overtaking it, but makes a huge impact. For me, the piece becomes a one quarter slice of the axis of the planet. The architecture of our world. Dworsky and I were able to discuss materials, spaces and methods, but nothing could have prepared me for the physical reality of the piece. Alisa took ribbon, hardware and weights and made a space born of physics and air. Her drawings quite literally flatten the piece using ribbon and graphite. The erasures and the grissale line fills me with the joy that usually only Celmins and Ruscha can. Martha Lewis takes visual cues from systems that usually do not find themselves in contact. The mechanical, biological and architectural forms marry in unreal ways. Even in a primarily abstract work, the forms clearly relate to a broader group of systems at work. I liken much of these places to themes in William Gibson’s “Neuromancer”. These are built for us out of the things we recognize but skewed beyond the bound of our our reality engine. The thoughts of many worlds creation are encoded in these works. As an artist, she added a structure that bound many of these works together. As the Artspace Educational Curator, she was instrumental in making this show a success. I am proud and lucky to have this show exist.